For a romantic, beautiful and reasonably priced special wedding charter – Give us a call. Nothing beats the romance of a yacht on the ocean and we have several yachts to select from. Generally we slowly cruise in a quiet place, such as Glorietta Bay, perform the service and then do a San Diego Bay tour. It may be structured anyway you wish, however. The actual wedding site is also your decision. We do recommend at least 3 hours. 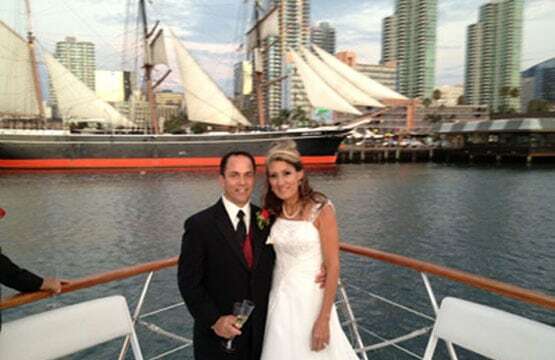 Yacht Weddings can also be combined with land-based weddings taking play along San Diego Bay, either picking up or dropping off the wedding party. It is a perfect way to make a grand entrance or to leave. We would be happy to work with you or your wedding planner to provide a very unique venue for your special day. Perhaps you are going to elope to San Diego and wish a simple wedding. A wedding or vow renewal on the water is very special, providing that something extra that will add to your memories of the event forever. We can coordinate with extras such as clergy, catering, photographer, ice carvings, ring buoys, etc. 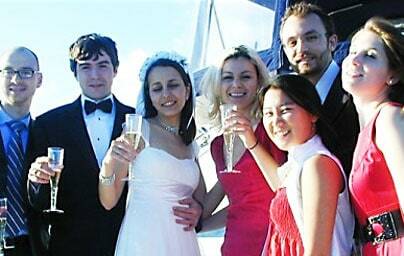 Everyone has attended a church wedding or a wedding at some special land-based location, very few have attended a yacht charter event. During the day the scenery is very special and at night the lights of the city and their reflections in the water cast a special spell. It is a venue truly like no other. There are several activities related to having a wedding, which complement your special event, for which you may wish to use out yachts services. It is all about providing rich memories for both yourself and the wedding attendants. All these events are very unique and will provide rich memories to complement your special event.